With nearly 24 hours of recovery after the Chachani climb, Forrest and I headed to the bus station in Arequipa at 6am to spend most of the morning on the bumpy and swervy roads to the small town of Cabanaconde on the lip of Colca Canyon. Once we arrived, we figured it was too late to head down into the canyon for a day hike, so we checked into a hostel right in the central plaza and went for a hike around town. The next morning we packed up and made our way into the canyon expecting a long and hard day of going down and coming back up the 1000m under the pounding sun. Little did we know there was a great place to spend the night down along the river at the base of the canyon. We were happy to take our time and lounge around the spring fed pool, sleep in grass huts and make the steep and long ascent in the relatively cool hours of the morning in the shade of the eastern wall of the canyon that we were climbing. 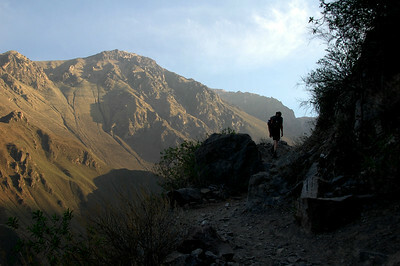 This entry is filed under: Earth, Hike, South America, Story, Video. that's awsome, I love it that you're wearing our TEAM BICEP t shirt.